Moe than 500 flags are expected before the whole project is installed. Students walk beneath teal flags strung along Grand River, across the street from campus, on Friday. Hundreds of teal prayer flags will soon fly high over Grand River Avenue in a project to honor sexual abuse survivors. Exactly 505 flags, one for every known survivor of former gymnastics doctor Larry Nassar’s sexual abuse, will line the street throughout April, which is sexual assault awareness month. Each one has a survivor’s name embroidered on it. Students and community members detailed the flags with messages of support. More than 4,000 people have helped personalize the flags. 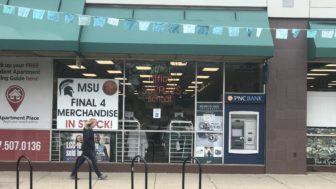 The first installment of flags went up Tuesday, but more were planned during the week and into next week, according to Cathy DeShambo, environmental services administrator for the City of East Lansing. “There are four different sections down Grand River (Avenue), so you’ll see a section around Abbot (Road), and as you move east, there are three more sections and it ends currently at Collingwood (Drive),” DeShambo said. 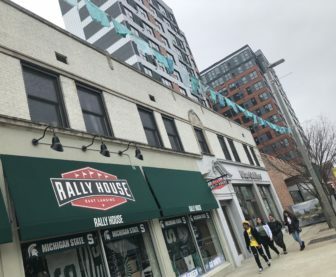 Strings of teal flags coincided with and hung over merchandising along Michigan Avenue for the week in advance of the Michigan State appearance in the Final Four. As for where the rest of the flags will go, DeShambo said locations are still being determined by the city’s Department of Public Works. The project comes from a collaboration between the city of East Lansing and Parents of Sister Survivors Engage, or POSSE, the group of parents that created the flags. Von Frank is also founder and chair of POSSE. It’s a collective of parents that started as a support group around the time of Nassar’s sentencing hearing in January 2017. Since then, some members have engaged more actively. She said the idea for the prayer flags came while John Engler was interim MSU president. After big teal bows tied around campus trees were taken down in July, von Frank said there was a feeling the campus was too empty. “There wasn’t enough teal,” she said. Th flag project has been in the works since September, but it has taken longer than expected to come to fruition. “The number of flags changed as we had more women come forward as victims, a second wave of women, and it just became a much bigger project,” von Frank said. As the idea evolved, POSSE decided to have student and community members write messages on the flags. Von Frank said she saw that people wanted to share their own experiences of sexual assault or sexual abuse, too. Student organizations, including Reclaim MSU, MSU Women’s Council, the MSU College Democrats and others helped with flag-signing efforts. “For moms and dads, it’s a visual remembrance of what happened, and us trying to keep the conversation going, because we need to not only remember our girls, but we need to keep talking about sexual assault,” von Frank said. A dedication ceremony is expected, but details about date, location and time have not been released.